The EMF detector is an essential part of a ghost hunter’s toolkit. 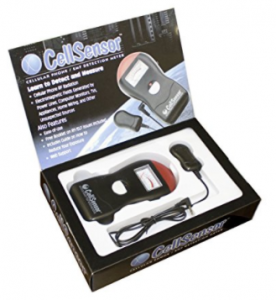 The EMF detector detects and monitors the electro-magnetic field around the device. All consumer electronics and even some battery operated items e.g. mobile phones and walkie talkies can set off EMF detectors. It has been found that high levels of EMF or EMF spikes tend to occur at the same time and in the same location as paranormal activity. It is important to do a sweep of any area you are going to be investigating to make sure that you get base readings of the EMF levels. By doing this, you then know that if you get any sharp spikes or unusual readings they could be due to other unexplained or spiritual reasons. If you are just starting out and want a nice cheap way of monitoring EMF levels then this budget EMF detector will do the job nicely. It gives you a digital readout of the EMF levels it is detecting. The one downside with this device is that it has no light on the LED screen, meaning that it is hard to read in the dark without the help of a torch. However, for £7.89 you can’t really complain. This model is available from a few sellers on Amazon, all for the same price. A popular model on the early episodes of TAPS and Ghost Adventures, this EMF detector is great because it combines an LCD display with a light and audible alarm. When higher levels of EMF radiation are detected, the red light on the top of the device will come on and an audible alarm will sound. This is really useful when you want to leave the device in another room or locked off in front of a camera as you can hear the device detecting any high EMF levels and don’t need to watch it all the time. Due to the multiple ways of monitoring EMF radiation, this device is pricier at approximately £45. 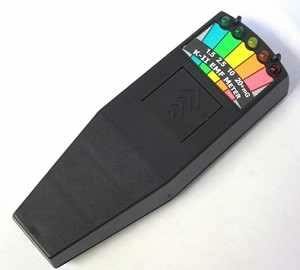 Another device made famous by the various ghost hunting TV shows, the K-II meter provides a less accurate way of measuring EMF levels. Instead of having an LCD display, it features a series of lights that light up depending on the levels of radiation detected. The K-ii EMF detector is definitely more suited to ghost hunting as it allows you to see instantly when the levels change. It also means you do not need to be right up close to the device to see any changes as the lights make it very obvious even when across the room. At a similar price to the model above (£45), it is not a cheap option and the lack of an LCD display does make it less appealing. Nearly all ghost hunters have this option however as it is seen as a status piece due to its popularisation on TV. In our opinion, the Cell Sensor version is a better addition to your toolkit. With the advancements in technology, it was only a matter of time before someone invented a device that works with a mobile phone. This small detector plugs into the headphone jack of your mobile phone and, combined with an app, turns it into a handheld EMF detector. The device is less sensitive than the tools dedicated to this function, but it still makes a handy little device to carry around. Its small size makes it easily portable and it doesn’t draw attraction, making it easy to use in stealth ghost hunting situations. At just £28, it is also a nice price compared to many other devices. This device is very much a home engineered EMF detector. It features two large antennas and an LED light that gets brighter, the larger the field. It does not allow you to pinpoint just how high the field is. 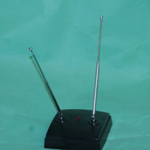 However, the large antenna allow you to measure a larger area. It is just under £20. Boo Bear JR is a small furry teddy bear that also contains lights that display when EMF radiation is detected. It is a great device to use as a trigger object to attract child spirits to interact with it. Boo Bear Jr is not cheap and currently retails for around $99 but we have one and have had great success using it to encourage engagement with the spirits of children. 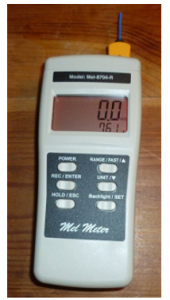 The Mel Meter is about the most sophisticated EMF detector on the market. It allows you to measure EMF radiation accurately using the backlit LCD screen. It also monitors the ambient temperature, saving you having to buy another device. The third part of the monitor that really makes it worth the money is the built in proximity sensor and alarm on the top of the device. When it detects a fluctuation in the EMF field around the sensor on the top of the device, an alarm sounds alerting you to the change. Best of all, the device is small and compact. While it costs around £90, in our view, the Mel Meter is the best EMF detector on the market. Previous: Previous post: What is Cryptozoology? Next: Next post: Is a Ouija board dangerous?